The name was changed in America because there is (or was?) 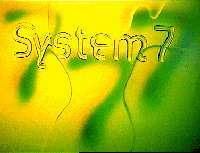 another band called System Seven - a rock band in fact. System 7 was never a registered trademark of Apple Computers and in fact we released our first promo under that name at least 13 months before the System 7 operating system became available. However, you might like to know that we also love the name 777, and that it was us who organised the name change for America, long before our first release on Astralwerks. We think that having 2 compatible names is a cool concept that fits with the way we see ourselves as an open-structured band. We also don't mind people thinking that Apple Computers were the obstacle here. In fact we think Apple are corporate and unsympathetic (to say the least!) for not sponsoring us with 2 free 500mhz G4 Macs, as we helped publicise their operating system for years, locked as it was - and still is - in a bitter David and Goliath sales war with Microsoft Windows. 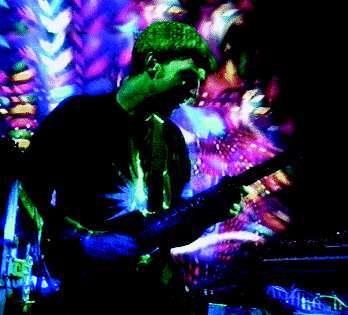 Since 1996 we have been licensed by Cleopatra Records in the USA, on their label Hypnotic. They wanted to use the name System 7 - and so we stopped using the name 777 for all releases on Hypnotic. By April 2000 no problems have been encountered so we guess this must mean that the problem is now solved!